Maxi D3 2000™ is your logical source for supplemental vitamin D. It supports calcium absorption in the gut and the mineralization of bones. It also supports modulation of neuromuscular control and reduction of inflammation. Maxi D3 2000™ is made with 2000 IU of vitamin D3, the most absorbable form of vitamin d. That’s why you want vitamin D3 preferred over vitamin D2. 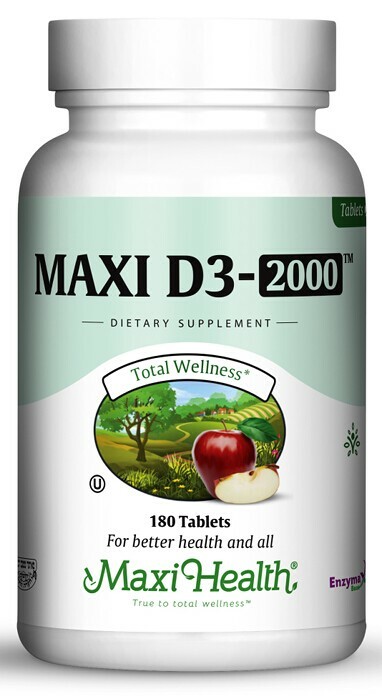 Try Maxi D3 2000™ to support your health. Other Ingredients: Dicalcium phosphate, microcrystalline cellulose, Enzymax® (calcium carbonate, bromelain, papain, lipase, amylase, protease, silica), stearic acid, magnesium stearate, croscarmellose sodium, silicon dioxide, aqueous film coating. This product contains no soy, wheat, gluten, salt, yeast, milk, artificial flavors, colorings or preservatives. After waking up with a terrible cold one day I took a handful of Maxi D3 it worked wonders!